Picfair, the London-based startup building a new ecosystem for photographers, today launched free personalised stores for every photographer on their platform. Picfair Stores allow their growing community of 35,000 photographers to sell downloads and prints from their own website! Picfair’s Stores represent a ground-breaking combination of services for photographers – the control and personalisation of a website builder; the commercial capabilities of an e-commerce platform, and the exposure of a marketplace, with added price control and fair royalty splits. Picfair launched in 2014 with seed funding from angel investors including Reddit founder Alexis Ohanian and Google Ventures partner Tom Hulme. 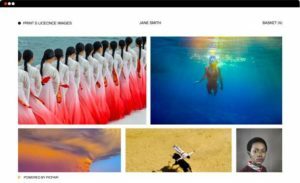 The platform has grown into a community of over 35,000 photographers in 130 countries, with a library of over 6 million images ranked by Picfair’s curation algorithms on its marketplace. Images taken by “amateurs” and championed by Picfair have already been licensed for the covers of top-tier publications and in marketing campaigns by global brands. In August, Picfair launched printed products alongside its editorial, commercial, and advertising licensing options, giving photographers the ability to sell their images as canvases and prints, produced and shipped globally by Picfair. Be the first to comment on "Picfair launches personalised stores for 35,000 photographers"